If you’re like me then you have a passion for living life well – being intentional, effective, productive, and impactful. Ultimately, living like Jesus. You want to grow and develop. You want to learn and lead. You want to live a life that matters and avoid wasting time and opportunities. You want to leave a lasting legacy. For those of us who want to live intentional and impactful lives like Jesus, we understand that this must take place in the practical everyday stuff of life. It can’t be compartmentalized, it has to be holistic. It can’t only be intangible spirituality, it has to also be physical reality. Our spirituality has to work itself out in our practical lives. If this is true of you than you’re like me in that we aren’t usually the type drawn to monastic lifestyles, seeking to be shut up from the world studying and talking theology and philosophy all day long (even though there is a time and place for that and we enjoy that at the proper times). We ultimately want to be out and about, creating, working, fighting, impacting and changing things. We want to make a difference. But, as my friend Neal Samudre wisely said, “You can’t make a difference without being different.” Becoming difference-makers will only happen when we allow Jesus to make us different from the inside out. Impact and change always start with each of us individually. If we aren’t willing to allow Truth to impact and change us, how can we think the Truth will impact and change anybody through us? Jesus works from the inside out in all levels of human existence. To change the human, He changes the heart. To change the church, He changes the individual. To change the world, He changes His people, the church. The desire for impact we have will only become a reality when we choose to let God be the master of our destiny; When we choose to let Jesus be the hero of our story; When we choose to take the servant position and steward what is ultimately God’s anyway – our whole selves. I fundamentally believe that this kind of intentional and impactful living all begins with stewardship. So what is stewardship anyway and why does it matter? A steward is a servant set with the charge to manage, invest, and care for the property of someone else, usually a powerful master. A steward doesn’t come up with the raw materials for himself; he simply receives the raw materials he’s given and begins to work with them and invest them in order to maximize the potential of what he’s given. This is done not ultimately for himself but for the benefit of the property and asset owner. This is what Jesus teaches us in Matthew 25:14-30. Here we see a master who is going to leave for a long journey. Before he leaves he entrusts his property in varying amounts to three servants (stewards). After the delegation takes place, the master takes his journey and the servants begin to work. Two of them diligently invest and trade what was given them while the other takes the easy road and buries it for safe keeping until the return of the master. When the master returns we see him blessing the servants who stewarded well what was given to them, while we see him cursing the servant who was lazy, took the easy route, and made excuses for not diligently working to achieve the success of his master. We also see in the text that those stewards who strove for the success of their master also received success for themselves, but the servant who only strove for himself and his own skin lost all success. The amazing reality is, all good stewards are greatly rewarded. The biblical character of Joseph is a great example of this truth. No matter what situation Joseph found himself in or what position he was given, he served well, made his master successful and in return was greatly rewarded. He was a master steward and God used him to impact the known world at the time. So, what has God entrusted us with? What has He given us to steward? The answer is: everything we have. This includes both the tangible and intangible aspects of ourselves and our possessions. It includes our physical body, our mind and intellect, our willpower and volition, our heart and emotions, and our spiritual being, our soul and spirit. In other words, your whole self, all that you are and have. The truth is, all Jesus-followers are already stewards. We simply have to accept the truth and embrace our calling. Our purpose, our vision, our mission, our calling is all wrapped up in being good stewards of what God has given us. As the New City Catechism says, “Our only hope in life and death is that we are not our own but belong God.” This is why stewardship is such a great paradigm for understanding our lives as Christians because it harks of being given something rather than creating, designing or taking something for ourselves. The question is not whether you are a steward but whether you are a good steward or a bad one. Becoming a good steward happens in two steps: 1) accept the truth that you are not your own but belong to God, and 2) take biblical responsibility to properly use the energy, time, gifts, abilities, and possessions the Master has given you to steward. Let’s explore these two steps in more detail. We must relinquish control. Too often we try to control everything. We try to be the masters of our own destiny by creating our own vision for life rather than discovering and owning the vision Jesus has for us. We try to design our own lives and create our own realities. We try to be the hero of our own story. But the truth is, Jesus is the hero of our story. He has a vision and destiny for our lives. He is the big “D” designer of our existence and we are called to live in His design, ensuring that any little “d” designing we do is under His authority and held with open hands for His influence and control. Although the call of self-denial and cross-bearing is tough and ultimately impossible for us to do without the Spirit’s indwelling power, the reward found in Jesus and in the eternal life He gives us is incomparable. Jesus says true life is on the other side of death. Not only in the ultimate eternal sense, but also in the immediate current sense. Jesus doesn’t call us to death for the sake of death but for the sake of life. Even in His own death it was for the “joy that was set before Him.”3 It was not some morbid mission to simply die for the sake of dying. Jesus is telling us that if we will deny ourselves, die to pursuing life and success in the way we see it and the world around us sees it, then we will be able to experience rebirth, true life, life as it’s supposed to be lived, life as stewards. Stewards pursuing a version of life and success the way Jesus sees it. Good stewardship is like an art form. It’s skillful and it’s beautiful. The Art of Stewardship is the strategy, tactics and methods of living life as a steward. It’s life absolutely surrendered to an Almighty Creator God while simultaneously taking responsibility for those things He’s called you to take responsibility for. This is living life in the framework and design of a magnificent, majestic and brilliant Creator. It is in this way that we operate as little “d” designers, as little “c” creators, as little “m” masters without usurping God’s place of big “D”, big “C” and big “M” in our lives. This is the skill and art of stewardship. This is the remarkable reality about the way God has designed and crafted this whole thing to work. In His impressive creation, we become imitators of Him in how we plan, design and master ourselves and our lives as we seek to be good stewards. Herein lies the beauty of godly stewardship: taking a steward position allows us to live in the design, vision and destiny Jesus has for us while taking the responsibility He calls us to take over the things He has given us to invest in, care for and cultivate, planning and designing our days and lives as little “designers” and little “creators” under His ultimate authority and will. This is the secret to the art of stewardship, which really isn’t a secret at all because it’s exactly what Jesus and the rest of Scripture teaches us. He calls us to deny ourselves (aka, put our agenda for our lives to death, exchange our advancement for His advancement, and surrender our authority over our lives and accept His authority). But He doesn’t just leave it there. He calls us to join in the work with Him as He proves and prunes us, refines and sharpens. God doesn’t call us to “let go and let God.” He doesn’t tell us to be spiritual couch potatoes. He calls us to action. He calls us to build our faith stronger with specific qualities (2 Peter 1) and to be imitators of Him (Ephesians 5:1). Apart from grace-engineered, grace-promoted and grace-powered responsibility and effort in stewardship, the believer is left disillusioned that God didn’t do what He said He’d do. But the truth is God will rarely do what He has called us to do. Sure, there are always exceptions, we call those miracles. However, in the normative created order of things, God has called us and given us the indwelling Spirit of Christ and the ability to respond to Him in a grace-empowered way to obey and achieve what He has given us to do. This is the heart of all stewardship. Stewardship is built on 2 Big Ideas. We are not our own but belong to God – everything we are and have is a gift from God to be used wisely and intentionally. We are called to take biblical responsibility to properly use the energy, time, gifts, abilities, and possessions the Master has given us to steward. Our first stewardship responsibility begins with godly Self-Stewardship. Once we accept our position as the Master’s stewards, fully seeing ourselves as belonging to God, set apart for His mission and purposes in the world, then we can begin to properly steward all the responsibilities he gives us. This begins with what I call “self-stewardship,”, the biblical alternative to the world’s improper view of self-love. If you’re ready to take this incredible journey as a steward, join me in part 2 of this series where I write about exercising this important aspect of life. God has given you a tremendous amount of capital to steward well for His Kingdom. Let’s commit to godly Stewardship for the glory of God and the good of others. How do these truths impact you? What will change about how you approach your life? 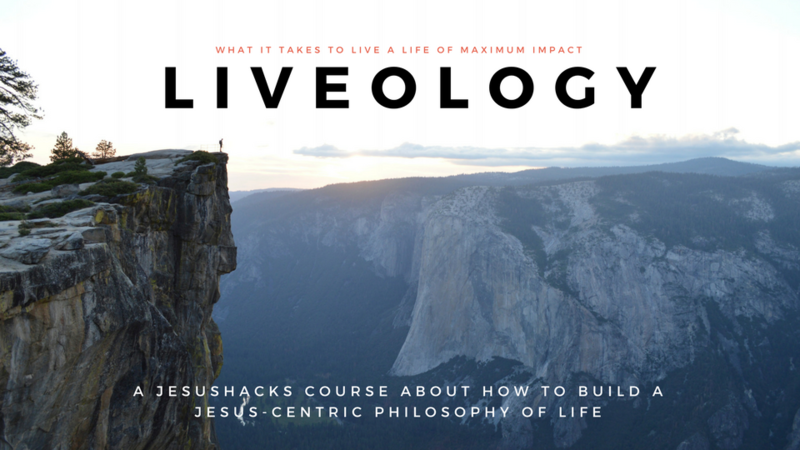 Registration for the JesusHacks Liveology Course is currently closed. It will open very soon! Success! Now check your email to confirm your subscription and download your free gift.